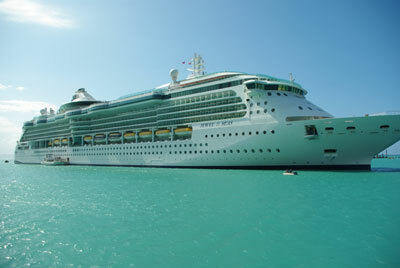 We sailed out of Miami, the cruise capital of the world, on March 13, 2009, aboard Royal Caribbean's Jewel of the Seas. Two thousand passengers. Another thousand courteous and efficient staff and crew. Thirteen decks. Two swimming pools. A theater with live entertainment every night. A casino ("19" is roulette's lucky number). Self-leveling pool tables. A jogging track (six laps equals five to ten miles, depending on how far the ship sails in the meantime). A climbing wall (way to make it to the top, "L", twice!). More bars and lounges and restaurants than you can count. Congenial dinner companions. Great food in copious quantities (just don't order Tex-Mex outside Texas). 75,000 eggs per week. Per person. (OK, an exaggeration, but not by much). Enough activities and distractions to make eleven days fly by (you're never so bored that you consider attending the spa's class on "Getting the Most Out of Seaweed"). Do take advantage of the champagne art auctions. We walked off the ship with lithographs by Jan Balet and Anatole Krasnyansky. That's the Jewel of the Seas. Labadee, Haiti: Can You Hear Me Now? The first port-of-call was Royal Caribbean's private beach at Labadee, Haiti. It's changed much since our first visit a decade ago. Then, the farther out you walked, the more the peninsula resembled your own private, isolated island paradise. The sand and palms and waters are as beautiful as ever, but signs of development are everywhere. A zip line now takes you along the beach, end-to-end, in about 30 seconds. A pier and restaurant are under construction at that previously isolated tip of land. On Labadee beach is where Ellen lost her cell phone. Now that the trip is over, we can always refresh our memory by calling her cell phone, which is still enjoying the sand and sun somewhere in tropical paradise. Who knew that Columbia could be good, not just for drug traffickers, but for tourists, too? Our second port-of-call was Cartagena, one of the oldest cities in the Americas, dating back to 1533 and home to over a million people today. Its fortress and colonial walled city are popular tourist destinations, and deservedly so. Aficionados of medieval cruelty are sure to like the Palace of the Inquisition, which has instruments of torture on display. Las Bovedas (the Dungeons) is today a row of souvenir shops. Scattered throughout the old quarter can be found living statues, young men painted black head to toe and frozen in various poses. It's been said that familiarity breeds contempt, something that the next group of men might think about when one of them suggests that they ought to join the already large ranks of living statues, too. When you think of cruises to tropical ports you don't think of high altitudes, but that's what you get when you travel to Costa Rica's capital of San Jose. A three hour ride from the Atlantic coast starts with two hours passing by endless plantations of bananas, pineapples, rice and coffee. Then, you make a turn and begin climbing, up through the rain forest, past the national park with its zip line above the forest canopy. You watch the elevation indicator on the GPS receiver rise steadily to 3000 ft, 4000 ft, 5000 ft, finally topping out at just over 5280 ft, a mile high. Once over the continental divide, you quickly drop a thousand feet to San Jose, the capital and hub of Costa Rica. There, it's cooler and drier than the hot and rainy east coast. The Gold Museum, with its pre-Columbian gold art and jewelry, and the National Theatre, a hundred-year old opera house, are primary attractions. We had lunch in Le Chandelier Restaurant: "The elegantly appointed rooms are dark and earthy, with portals in the walls filled with statues, wood carvings, ceramics, antique musical instruments and other unique treasures." (Costa Rica Nature Adventures). The full day and a good meal combined to induce a siesta on the ride back to the ship. See our Costa Rica track on Google Maps here. A tiny, whale-shaped reef in the Caribbean, uninhabited when Columbus discovered it, Grand Cayman is today a tourist mecca for scuba diving, snorkeling, swimming with sting rays and turtles, and shopping, shopping, shopping. Caymanite. Black coral. Tanzanite. Diamonds. Columbian emeralds (in case you didn't get any in Cartagena). Cartier and Fossil watches (in case you can't get to Richardson, Texas, Fossil's headquarters, to buy them). Waterford and Wedgwood. Rum and Cuban cigars. And, if you didn't get enough food on board, a Hard Rock Cafe, a Señor Frog's, and a Jimmy Buffett Margaritaville. See our George Town track on Google Maps here. Eleven days. Ten nights. Five ports. Two satisfied customers. One wonderful anniversary. Sometimes, it's the smallest number that matters most.